It uses CDMA EVDO Technology that provides data speeds of up to 3.1 Mbps and offers fast, wireless broadband speeds to help you achieve LAN-like mobility. It helps increase productivity while maintaining contact with clients, colleagues and family. Its high efficiency compact broadband design provides consistent throughput performance. Moreover, its automatic switching between networks enables fast and secure wireless access to information anytime, anywhere worldwide. 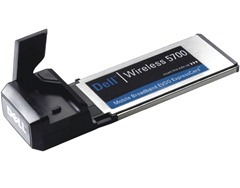 Release for the Dell Wireless 5700 Mobile Broadband (CDMA EV-DO) Express card connection manager.